1. Heal my shin splints and get completely injury free before I start my next training regimen. I have mentioned that I am signed up for the Phoenix Rock and Roll Half Marathon in two weeks and have been just pushing through my training, despite pain in my inner-shin on my right leg. This week I took two days off of running and cross trained on the bike and pool and my pain completely went away, but low and behold, during my 10 miler today it came back. I need a solid couple weeks of not running post January 19th and then ease back into a new training plan once I am feeling healed. 2. I saw in interesting challenge on a website I came across on twitter. It’s the Run This Year Challenge. There are three ways to participate: (a) run 2,014 miles in 2014 (b) run 2,014 Kilometers in 2014 or (c ) set your own goal for 2014. Running 2,014 miles seemed like a little ambitious for me since I only ran 1,060 in 2013, but the 2,014 Kilometers seemed within reach – 1251.4 miles. I signed up for the challenge and entered my first weeks miles (14!). Throughout the year they will have giveaways and will have monthly totals of the participants. I’m looking forward to being part of a community with a similar goal. 3. My last and most lofty goal: The marathon! I need to avenge my first marathon and finish strong. 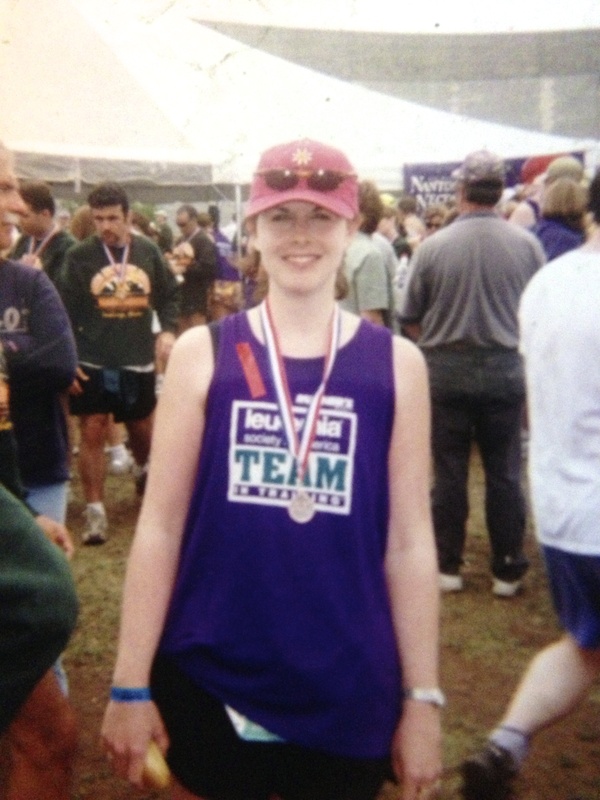 I barely crossed the finish line in 1999, and want a ‘redo’! I don’t even know how I was standing for this photo after practically crawling with exhaustion the last six miles of my first marathon. I really, really, really wanted to tackle this one in 2013, but was derailed by injury mid-training. I haven’t selected the race yet, but am thinking an early fall race would be nice. It will give me a chance to build my base again through the spring and then add some speed work this summer. Possible races: Twin Cities Marathon, the Milwaukee Lakefront Marathon, or maybe just my hometown race the Duke City Marathon. What are your goals for 2014? Are you aiming high?